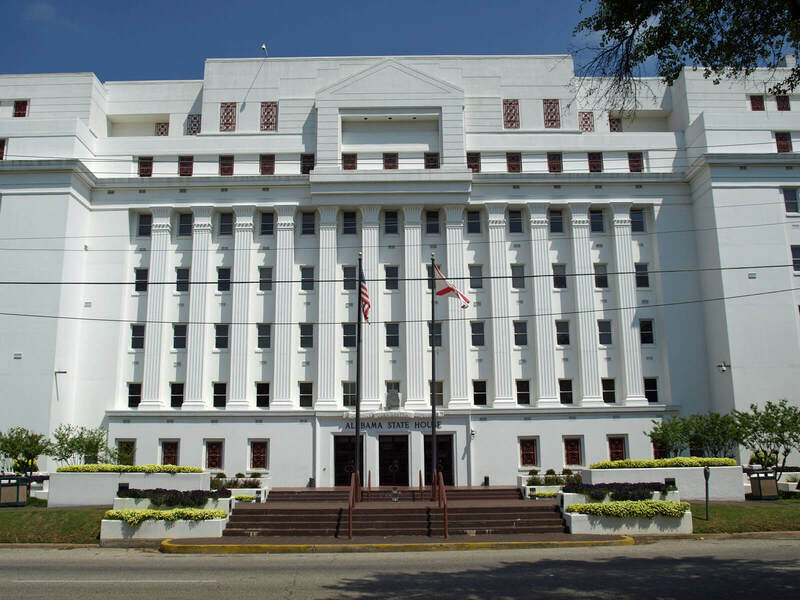 In light of proposed cuts to education, public safety and health care as a solution to Alabama’s $200 million budget shortfall, the complete elimination of the state’s funding to the Alabama Department of Environmental Management (ADEM) has been largely overlooked. But without state funding, the only recourse for the historically underfunded agency could be to pass those expenses on to the industries it regulates through an increase of at least 20 percent on environmental permit fees, which have already increased twice in the past four years. ADEM’s funding comes from federal grants, permit fees and appropriations from Alabama’s general fund. 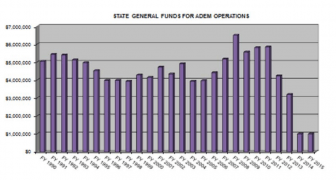 In FY 2008, ADEM received more than $6 million from the state, but that number has gradually declined to the $1.5 million it was allocated last year. In both budgets proposed so far for FY 2016, that funding will be wiped away entirely. 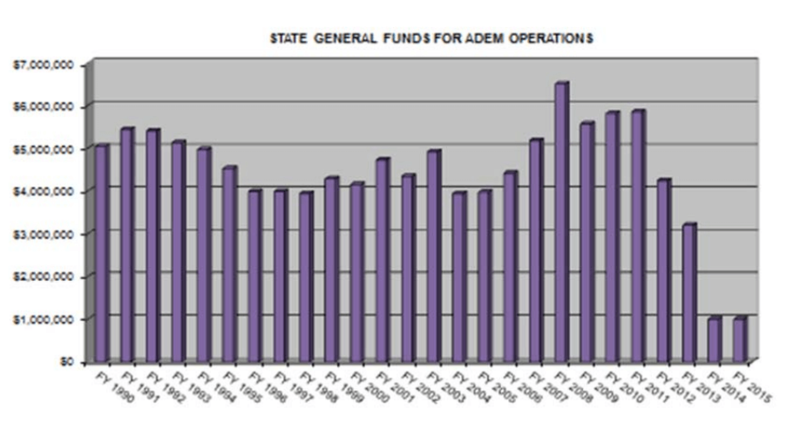 A snapshot of ADEM’s funding, which is currently at its lowest level in history. LeFleur said an EPA takeover is not just a conservative campfire horror story. The federal agency enforces the Clean Water Act, Clean Air Act and Safe Drinking Water Act, but delegates those tasks to ADEM and other state environmental agencies across the country. According to LeFleur, one of the stipulations of the arrangement is that the state agency be properly funded. According to executive reports to ADEM’s board, a complaint in 2010 filed by multiple environmental groups cited 26 issues LeFleur said boiled down to enforcement and funding. The EPA either has or will throw out the majority of those claims, except ones pertaining to funding, according to LeFleur. LeFleur said money has been a “challenge” in recent years, and shouldn’t be surprising considering ADEM is ranked 49th when compared to the general fund appropriations of other states. If the EPA was to take over, LeFleur said it would have a chilling effect on business in a state that routinely touts itself as business friendly. The issue of funding ADEM is one on which both regulated industries and environmentalists have been able to find common ground. Casi Callaway, executive director of the environmental group Mobile Baykeeper, called ADEM the “boots on the ground” when it comes to ensuring the quality of Alabama’s water and air. Lyons said businesses like those operating in Mobile’s port don’t want permit fees to increase for obvious reasons, but he said the bigger detriment to industry would be a hindered ADEM or the “disturbing” prospect of a federal takeover by the EPA. In the budget, which the legislature has produced twice and Gov. 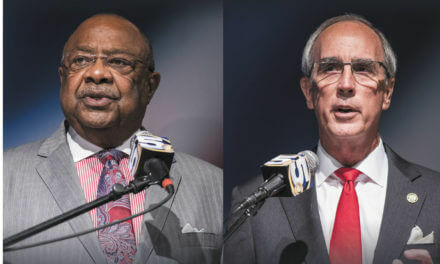 Robert Bentley has vetoed once, the state is looking to ADEM for about $9.3 million. With only $1.5 million coming from state, the budget also calls for $7.7 million to come from funds ADEM set up legislatively to fund specific environmental operations — some of which generate revenue through direct fees on industry, local government and citizens. Though there hasn’t been any specificity to exactly which fund would be on the hook, ADEM only has three sources to pull from: a scrap tire fund created in 2003 using a $1 charge added to all tires sales, a solid waste fund assessing a per-ton fee for garbage sent to landfills, and a fee paid by businesses utilizing underground storage tanks for fuel and other environmentally hazardous materials. However, during the special session last month, one provision in the House and Senate versions of the budget perplexed LeFleur — one that forbids any of the transfers to come from that storage tank fund. When asked about it, LeFleur said it acts almost as an insurance policy for businesses that use underground storage. He said business owners only pay a $5,000 fee when a tank is damaged or leaking, which LeFleur referred to as a deductible. The rest of the cleanup and repair cost is assumed by ADEM. Senate Budget Committee Chairman Arthur Orr (R-Decatur) said that provision originated in the House’s most recent version of the budget, which was proposed during a special session in August. Though there’s currently no evidence linking the provision directly to any special interest, both Orr and House budget Committee Chairman Steve Clouse (R-Ozark) have some ties to the oil and gas industry, which benefits from the underground storage tank fund. Clouse’s father, James Clouse, owns and operates Clouse Oil Inc. in Ozark, according to state disclosures, while records filed with the Alabama Ethics Commission last April show Orr owns at least 5 percent of Petrol Sales Inc. Clouse has not returned calls for comment. While speaking to Lagniappe on Thursday, Orr also said the transfers to the general fund ADEM and other agencies, like the Alabama Department of Conservation of Natural Resources, are facing is an effort “to be fair” to state agencies facing cuts to their general fund appropriations. 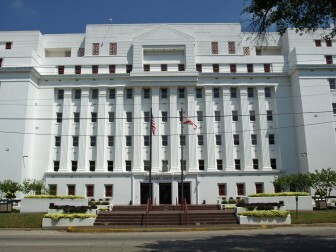 But, Orr downplayed the concern ADEM’s leaders expressed saying “those numbers are not going to be the reality.” Orr went on to say he was confident the Senate would not be presenting a third cut-filled budget when legislators return to Montgomery for a second special session Sept. 8. Similar to ADEM”s predicament with the EPA, Orr specially mentioned the possibility of a federal takeover of Alabama’s prison system if more state funding isn’t appropriated to corrections. “I think a lot of legislators weren’t aware of things, but I think they are now,” Orr said.